"The Spanish anti-doping agency is only just bringing into line its national legislation with the rest of the world to make it a criminal offence to take part in doping and to supply doping, and that was probably done to support the bid to host the Olympics in 2020." "This certainly could have supported that a whole lot more and made it look as though Spain was being tough and coming with the rest of the world on anti-doping. Instead, it looks like they've gone against it." What do elites really think of Letsrun? What book has changed your life the most? RRW: 2012 Comrades Winner Ludwick Mambolo Cleared Of Doping Charges On A Technicality Both Mamabolo’s “A” and “B” samples showed the presence of the illegal drug, but according to his lawyer “there was a system failure in the Comrades doping process”. The Inspiration That Leads To A Champion Race Walker: SA/African Champ Lebogang Shange: “When I saw [race walking on TV] I thought it would be much easier than running, so I decided to become a race walker." This Will Help Track Become More Popular (Not): Texas High School Relay Team DQ'd At State-Meet Qualifier When The Anchor Celebrated By Pointing To The Sky In A Gesture Of Faith Officials said it violated a rule about "excessive celebration". Study Finds Only One-Third of Americans Meet Activity Recommendations Colorado and Utah were among the most active states while least active states included Oklahoma, Mississippi, Kentucky and Ohio. Recommended Read: Paula Radcliffe And Her Husband Reflect On Her 2:15:25 Marathon WR, Which She Ran At London 10 Years Ago Her physio at the time, Gerard Hartmann, says she has the highest pain tolerance of anyone he'd ever worked with. "She would hurt me rather than me hurt her. She would actually break me down because I'd have to go so deep into the sinews, I would have to ice my thumbs afterwards I was in such pain." 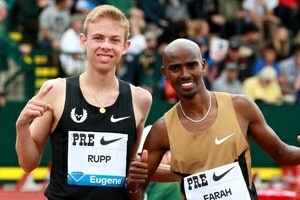 Tonight: Register Guard Preview Alberto Salazar: “We’re hoping for a time of 1:47 or under, something in that range. For Galen, obviously, this is much shorter than his normal stuff, but he’s trying to set himself up for a good 1,500 at Oxy. ... t’s just speed work." 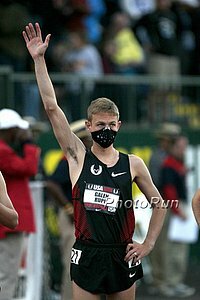 Galen Rupp And Matt Centrowitz In 800 Field For Oregon Twilight Ben Blankenship is also in the 800 as Dathan Ritzenhein and Luke Puskedra are in the 3k and Bridget Franek and Max King in the steeplechases. Also Today: Belarus’s 2008 Olympic Silver medalist Andrei Krauchanka In The Lead After Day 1 Of Men's Decathlon At The Multistars Comp. In Florence The Netherlands’ Anouk Vetter leads the women’s heptathlon. Next Saturday May 11 UAE Healthy Kidney 10K: WR Holder Leonard Komon Leads Deep Field Of Top Africans And Americans To Chase Big Money At UAE Healthy Kidney 10-K Meb Keflezighi is back in action leading the Americans Bobby Mack and John Grey. Top Africans include 2008 Olympic bronze winner Edwin Soi, former World XC silver and bronze medalist Moses Kipsorio and African Jr. 5k champ Abera Kuma as well as Former NCAA stars Stephen Sambu and Leonard Korir. Aussies Collis Birmingham, Ben St. Lawrence and Brett Robinson are also racing. 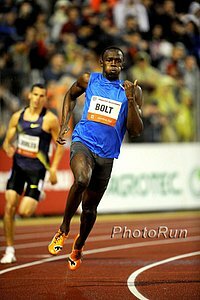 Jamaican Invitational: IAAF Preview: Men's And Women's Sprints Lead The Way At Jamaican Invy Men’s 100m features Tyson Gay, Ryan Bailey, Darvis Patton, Nesta Carter and Kemar Bailey-Cole. Shelly-Ann Fraser-Pryce in the 200 vs Bianca Knight, GB's Christine Ohuruogu in 400, Dawn Harper vs Queen Harrison rematch in the 100H, bronze medallist Warren Weir, Wallace Spearmon and Nickel Ashmeade in the 200. Olympic silver winner Luguelin Santos in 400. Rivals Allyson Felix And Veronica Campbell-Brown Arrive In Jamaica For Jamaican Invitational On The Same Flight They'll showdown in the 100m on Saturday in a field that also includes Trinidad and Tobago's World bronze medallist Kelly-Ann Baptiste and Jamaica’s 2008 200 bronze medalist Kerron Stewart. Jamaica's 60m WR Holder Lerone Clarke & 2008 Olympic Silver Medalist Richard Phillips Are Among 6 Athletes Who Have Pulled Out (Most With Injuries) Most with injuries. Sunday: Preview Of Sunday’s BIG 25 Berlin 25k: 2011 World Marathon Silver Medalist Vincent Kipruto Leads Men's Field Over Jacob Kendagor (Recent 59:36 Half) & Ghirmay Ghebreslassie (60:09 Half) In the women's race Lucy Kabuu (66:09 at RAK Half-Marathon) will try and break Mary Keitany's 1:19:53 WR (5:08 pace) and face 2011 Boston champ Caroline Kilel. Next Weekend: Will Leer Vs Recent US Road Mile Champ Garrett Heath Highlights The May 9th Medtronic TC 1 Mile Road Race In the women's field, defending champ Heather Kamf faces recent breakthrough steeplechaser Jamie Cheever. This Weekend: Allan Kiprono To Defend His Bloomsday 12k Title This Sunday Against Abdi Abdirahman And 2012 10k World Leader Emmanuel Bett (26:51) Past champions Simon Ndirangu and Gilbert Okari are also in the field as well as US's Brent Vaughn. For the women, 2011 champ Misiker Mekonnin will attempt to regain her crown while Alice Kimutai is the top seed with a 31:51 10k earlier this year. Japanese Teen Yoshihide Kiryu, Who Ran 10.01 To Tie The World Junior Record, Will Try To Go Sub-10 At Sunday's Seiko Golden Grand Prix He's already talking about going up against Bolt, saying, "I want to run alongside Bolt (at the Worlds) and see how he is different from me." 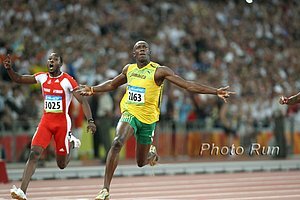 Bolt is taller, not Asian (no Asian sprinter has ever run under 10.00) and almost half a second faster over 100m, but Yoshide is .22 faster than any other youth (under 18) ever in the world. Friday: David Rudisha Says He's Recovered From His Cold And Will Open His Season At AK/National Bank Of Kenya Meeting In Nairobi He'll be in the 400, as will Pamela Jelimo. Others highlights include steepler Paul Kipsiele Koech in the 5,000 against Richard Mateelong, Isaiah Koech Kiplagat in the 1,500 and Olympic bronze medalist Timothy Kitum in the 800. 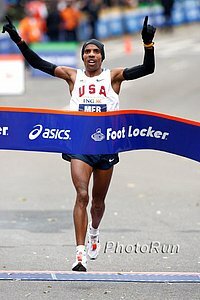 LRC 2013 Boston Marathon Men's Race: Lelisa Desisa Wins 3-Way Kick For Title And Remains Undefeated At The 26.2 Distance The race ended up being a fan and promoter's dream - a 3-way kick between 3 big names for the title. Since the local CBS station went to commercial, we hype up the finish for you and ask if marathoning has a new #1 in Desisa. 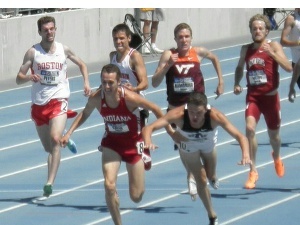 John Kellogg explains to you why the times were slow (2:10:22 FTW) and we point out how the slowest guy won the kick and just how special our predictions were. Plus Jason Hartmann (4th), Daniel Tapia (9th), Craig Leon (10th) and Rob Watson (11th) meant four North Americans in the top 11. 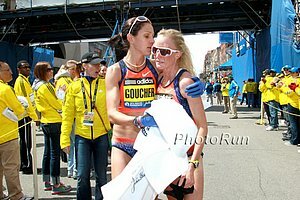 LRC Long-Time Track And Field Official Tommy Meagher Reacts Heroically To Boston Marathon Bombings Many of you certainly recognize Meagher - who in many ways is the "face" of running in New England. He passed the guts test with flying colors. LRC LetsRun.com Visitor Will Brown Talks About The 2013 Boston Marathon Terrorist Attacks The 60-year-old marathoner was just 2.5 blocks away and says "it was the biggest sound" he'd ever heard - so loud he "thought it was possibly a plane crash." Profile On NAIA Thrower Willy Irwin, Whose 63 feet, 11 1/2 Inches In The Shot Put Would Put Him 2nd In D1 He passed up a scholarship offer from Oklahoma for the chance to be coached by 1976 Olympic discus champ Mac Wilkins. Kenyan Javelin Thrower Julius Yego Gets Telecom Sponsor In his early days, Yego taught himself how to throw by watching YouTube videos. 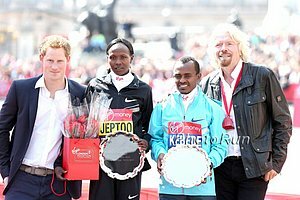 LRC No Boston Hat Unless It Has A Swoosh, The 2013 London Marathon, US 1,500 Stars Struggle, & How Do You Pronounce Tsegaye Kebede? This week we take a look at the struggles of the US 1,500 stars Manzano, Rowbury and Uceny, wonder if it's the year that Brenda Martinez and Will Leer break through, wonder if Abbey D will break 15:00, wonder what the name of the 2013 New York City marathon will be, explain to you why the men's times were so slow in London, tell you what Eliud Kipchoge, Paul Tergat and Haile G have in common, and lament the fact that Andrew Wheating can't wear a Boston cap unless it has a Nike swoosh on it. All of that and more including Usain Bolt the king and a HSer runs 8:46 in 15 mph winds.